If complex fracture dislocation make arrangements for patient to go to next available theatre session during daylight hours with upper limb specialist. Consent for closed reduction +/- open reduction +/- fracture fixation +/-hemiarthroplasty. Careful eliciting the history, i.e. position of the arm, should allow one to diagnose the direction of dislocation (see table). 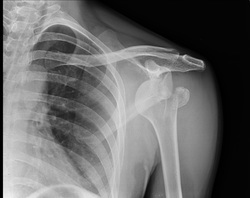 Recurrence dislocations may occur with ease (turning over in bed, reaching out to grab an object) and should be treated as per a primary dislocation in the acute phase (i.e. reduction and sling). Examination of the neurology should concentrate on assessment of the axillary nerve – deltoid function is difficult to assess with a dislocated shoulder but the sensation of the skin of the regimental badge area will give an indication of the nerve’s function. NB – the axillary is not the only at risk nerve from a shoulder dislocation so please assess the other upper limb nerves with care. 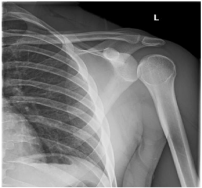 In polytrauma patients, diagnosis and treatment of the shoulder dislocation is part of the secondary survey. Make sure the primary survey is complete and the patient is stable prior to attempting reduction of a shoulder dislocation. Isolated greater tuberosity fracture dislocations in osteoporotic bone – these may well be associated with occult fractures of the anatomical neck or lesser tuberosity. Any patient at risk of osteoporosis should have a CT prior to any reduction maneuver. 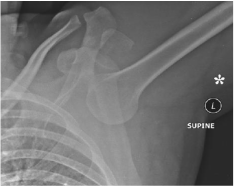 If a complex fracture is diagnosed then the patient should undergo open reduction to minimize the risk of fracture displacement. Nerve injuries are usually transient and should be only monitored in the initial instance. Habitual dislocators – these are typically young females who voluntarily dislocate their shoulder for attention seeking purposes (often as part of a psychological disorder). These patients may been well known to the A+E department. Discuss with your senior colleague prior to attempting dislocation. 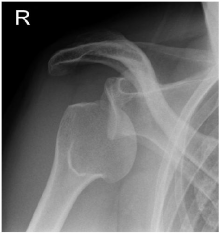 Luxatio erecta – this is pure inferior dislocation of the shoulder (very rare). The patient will present with the arm in fixed abduction or held behind their head. This condition has a high risk of neurovascular injury. Discuss with senior prior to attempted reduction.